We all like to have white teeth. However, consumption of coffee, tea, red wine, snuff and foods with a high content of coloring the dark. We are aware of the role of aesthetics in the mouth. Therefore, we offer different whitening techniques according to your needs and preferences. The Philips professional whitening system Zoom is the teeth whitening procedure that has triumphed in America and you can now enjoy in our Dental Clinic in Tarragona. Philips Zoom is the technique more scientifically advanced tooth whitening today. It is safe, effective and fast. This system is scientifically proven to whiten an average of 8 shades in one session of 45 minutes. The procedure is very simple. After protecting lips and gums, apply the whitening gel Zoom based on 25% of hydrogen peroxide on the surface of your teeth. Then apply the bleaching lamp Zoom that activates and causes the gel to penetrate the surface of the teeth. The light and gel Zoom coact to dissolve clarify possible stains and discoloration an average of 8 tones. During the procedure in our clinic, patients can watch TV, read a magazine or listen to music comfortably. After 45 minutes it takes the session, you’ll enjoy immediate results. We recommend making a dental cleaning before starting the whitening session. How long will the results? With proper care and adequate sanitation, the results can last for years. Recommend flossing, brushing several times a day and perform occasional maintenance with ACP NiteWhite gel, you can ease into our clinic. Following these instructions, your teeth will always remain whiter than before treatment. 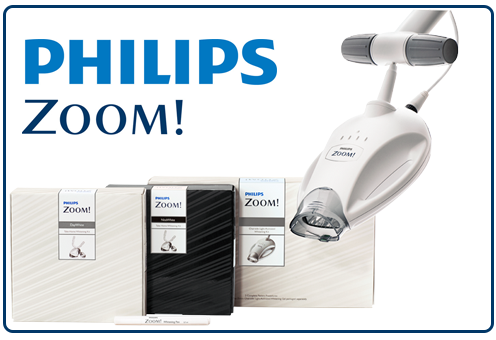 For more information about our treatment Philips Zoom you can visit the official website zoomwhitening.com. If you prefer to make yourself teeth whitening at home, we can put at your disposal the bleaching outpatient procedure. This treatment is based on a dental caps or custom splints must be placed in the teeth and wear them for several hours a day for 2 weeks. These splints contain a bleaching gel in 25% of hydrogen peroxide that will clarify the tone of your teeth without damaging your enamel. Tooth whitening ambulatory is convenient, safe and effective procedure. You can also opt for a treatment that combines the whitening in the clinic with the house, the technique that ensures you the most effective results. Phase 1: Whitening in the clinic: We conducted an initial session using the technique based on hydrogen peroxide gel activated by light Zoom bleaching. This session does not last more than an hour and is done at the clinic, where you can stay comfortably during treatment reading a magazine or listening to music. This system does not harm the enamel or affect the structure of your teeth. Phase 2: Whitening at home: The treatment is completed by the patient at home, using a dental caps or splints to be placed in the teeth two hours a day for two weeks, but the time may vary accordingly. This phase is always accompanied by regular monitoring and supervision of our staff, in order to ensure brilliant results. During the whitening process is not recommended consumption of materials with dyes or with a high degree of pigmentation, as coffee, tea or snuff, among others. The reason for this recommendation is that, during treatment, the teeth are more susceptible to attract external pigments and this could mean that the expected results are not achieved. Lumineers is the painless method to wear a nice smile. It consists of place thin porcelain veneers on your teeth in order to improve their color, shape or position. This system is minimally invasive: it is not necessary to cut the tooth. In addition, the procedure is very simple and fast, so in just two sessions you can enjoy a perfect smile. Selection of form and color: On your first visit we get measures of your teeth to make a dental Veneers. You can also choose the color with your dentist, who will advise so that the result remains as natural as possible. Check and placement: Once your masks are ready Lumineers are reassessed and stick on your teeth because of a special glue, without pain or stinging. Visit our Dental Clinic or ask us here any questions. We will check the condition of your teeth and will recommend the treatment that best suits you, without any obligation. Your first visit is free!